“This is one from the heart of darkness. 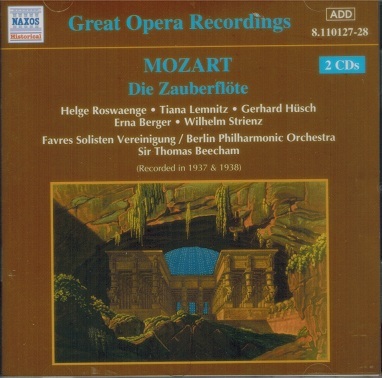 In late 1937 and early 1938 Sir Thomas Beecham travelled to Hitler's Berlin to record what would be the fourth in a series of Mozart operas to appear on the HMV label. The previous three had been recorded at Glyndebourne and conducted by Fritz Busch so you can imagine the feelings of Sir John Christie, the owner of Glyndebourne, when he realised what was happening. The thinking behind the decision by ace producer Walter Legge to record with Beecham in Berlin probably had to do with the cast available to him there, as well as the chance to record the Berlin Philharmonic and with a conductor unlikely to get within an ego's waft of Christie's festival. Legge, like Beecham, was also a showman so how could he resist all that? Also Furtwängler had just conducted Beecham's London Philharmonic in the pit at Covent Garden for a RING cycle as part of the Coronation Season, so maybe a compliment was being returned? Even then the fact that this was Nazi Germany meant that singers like Richard Tauber and Alexander Kipnis, surely in line for casting, were persona non grata in Germany so unavailable to Legge. Irrespective of that, Legge's decision to go to Berlin was vindicated in every way by the 19-disc set that resulted. Gerhard Hüsch is the star of the cast. His Papageno brings buoyancy and exuberance in equal measure. He was a supreme lieder singer away from the stage and that directness is a pleasure right through. I may be in the minority liking Erna Berger's Queen of the Night quite a lot, especially in the way her voice contrasts so much with Tiana Lemnitz's Pamina. True, she has slight moments of imprecision in her two big arias, but her strength and uniqueness, especially to modern ears, gives her the slightly sinister quality this part really needs. Tiana Lemnitz herself is smooth and sweet with her first act duet with Hüsch utterly charming. Richard Tauber would have been the ideal Tamino since Helge Roswaenge perhaps lacks delicacy when he needs to make us care about what happens to his Tamino in the way we do about Hüsch's Papageno, but he is dependable and no great trial. Which is more than can be said for Wilhem Strienz's Sarastro who in low registers is particularly unappealin. The real star of the production, however, is Beecham himself. From the overture onwards there is precision, wit and grandeur in his conducting. There is also a wonderful sense of pace and faultless accompaniment for his cast. All of that before you even start to consider the magic he brings which no amount of analysis could adequately describe. No wonder most of this cast were onstage at Covent Garden in 1938 with TB in the pit. But time was running out by then. The clock on the wall of old Europe was already ticking louder. 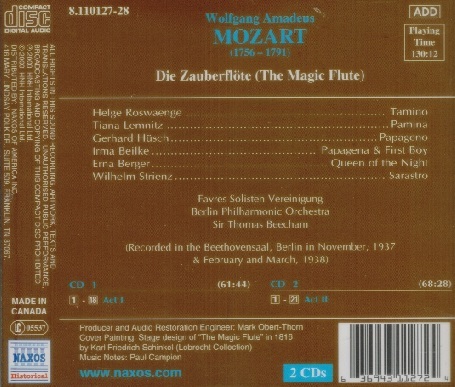 This was the first complete recording of the music from THE MAGIC FLUTE. An important distinction to make since the decision was taken to record none of the all-important dialogue. That would have meant too many records for even the most avid of collectors in 1938. However, for this Naxos release Keith Anderson's detailed synopsis includes a summary of what you are missing from the story, so that's something. Mark Obert-Thorn's transfers from spotless commercial pressings are also his usual models of restraint in that there are no fancy tricks employed to take you away from what is on the discs. He allows the voices especially to ride brightly over the gentle surfaces with no distortion at all and very little in the way of confinement. The orchestra is slightly behind them in the sound picture and, whilst betraying the age of the recording somewhat, there is more than enough detail from the players for us to take pleasure in their contribution too. But before I close let's return to where I began. It is still hard for me to separate the time and place of this recording from the excellence of the performance. Maybe it adds a level of interest to it because music making sometimes cannot be divorced from the world around it and when the world around it is so extraordinary this becomes a certainty. There is a moment midway through Act I where Tamino has received the Magic Flute from the Three Ladies. They tell him and Papageno that three boys will appear to help them on their journey after which the ladies bid them farewell. This has always seemed an exemplar of this recording's finest qualities and one you might care to sample first. The accompaniment is a model of phrasing, the singing uniquely together and the atmosphere simply magical. Perhaps I'm letting my imagination run too far but it has also always seemed to me a farewell from another period of European history and from within the very black heart that would in the end destroy it. Such beauty and such elegance surely shining brighter coming as they do from amidst such evil which at that time was merely brooding. Or is that just an illusion granted by hindsight? Nevertheless, for me it is the kind of added quality brought to music by recordings such as this over and above any musical values. I will always maintain their importance to those who call into question the very idea of ever listening to recordings made before the kind of quality in sound we started to take for granted in more recent times. 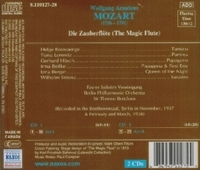 There are a number of CD versions of this recording available. I see no reason why this one should not be first choice….it couldn't be bettered." "[Lemnitz'] tone was flawless in its gentle power, her technique masterly in the breath control which would sustain long, unbroken phrases....essential points of reference whenever Lemnitz herself is remembered."